Aromatherapy and Nature Crafts is about creating lovely crafts with all those beautiful things that found in Nature. The environment around you is one of the best wonders of this planet of ours. Not only is it beautiful but it is also full of things that maybe used to help improve our daily lives. Additionally, the remarkable things about this planet are the array of colors that it shows to individual that over time made it a way of expression and was extended to relate to human emotion and mind state. Pleasant aromas have the power to alter our mood, so it is not surprising that the practice of using scent in the home has been used since long. 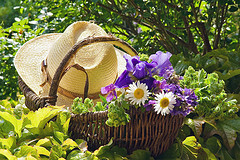 The use of flora to beautify one’s home and to provide a really good scent that is all natural is practiced worldwide. There are many ways to scent your home using flowers and herbs. You can arrange them in a bowl and make a potpourri bowl. Or you can make a fragrance sachet to hang in your closet or bathroom. Other ideas about Aromatherapy and nature crafts are making a wreath for your seasonal decorations, making pomanders to hang in the closet or arrange dried flower in a basket and placing them in the center of table. It seems good idea, right? And it’s very easy to make aromatherapy nature crafts that can actually make a positive difference, improving the atmosphere in our homes on every level, relaxing us, helping us to feel calmer and think clearer. Not to mention gathering the ingredients is fun for the whole family, and the results are sure to please. So, Let’s get our "Aromatherapy Nature Crafts" project get started ! Fragrance Sachets. - Fill small sachets with sweetly scented flower petal and tangy spices and aromatic herbs and use them to scent rooms, bed linen and clothes. Home Decor Wreath - Welcome visitors by hanging a festive wreath made from lush foliage and seasonal fruits and nuts, on the front door or in a hallway. Aromatherapy Bead - Beads as standard as it is may be used in numerous ways practically on a wide selection of thing in the household. Plastic aroma beads are made by combining essential oils and coloring with the beads. Free and Easy Homemade Christmas Crafts Ideas for aromatherapy lovers. Check out my tips and recipes for making an inexpensive gifts for your friends, neighbours or even your coworkers. 2 Unique and creative christmas gift ideas for your friends and family. Homemade Christmas gifts can prove to be the best kind of gifts you can share with your family, friends and co-workers this holiday season. Check out our 2 blends recipe for this upcoming holiday treat! Dried Flowers Basket. - The soft color and delicate spicy aroma of dried flowers brings beauty to the home.